As a nice break from pruning this afternoon, I did a little weeding. The weather is perfect for it–it feels more like March than January. The soil is nice a moist, and because the winter has been so mild, the weeds are growing actively. 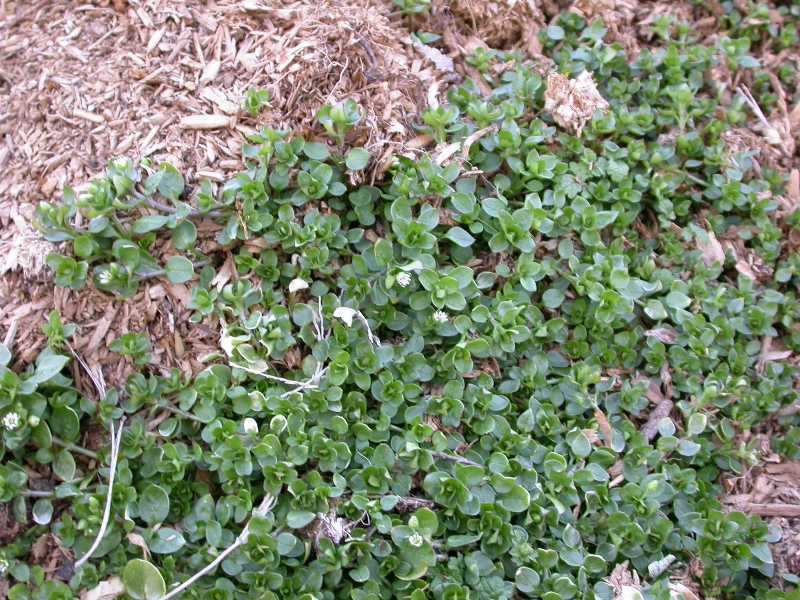 You can easily weed out lawn grasses that are encroaching on your flower beds, plus winter annuals like chickweed and those tiny mustard plants, Cressamine species, that have become such a nuisance in the past few years. Common chickweed, Stellaria media, is a weedy winter annual. It germinates in late winter or spring and forms large mats if you don’t keep it under control. Pull it out now when the plants are small and the ground is moist and easy to work. Winter is a great time to look for backyard birds. A tree with a dead limb, like this one, supplies ample food and shelter. — water new plantings: in any week in which we receive less than an inch of rain, and the ground is not frozen, water all plants installed this spring or fall. We have received at least an inch of rain per week for the past two weeks, so no need to water right now, but check back here frequently for updates. How do you know when we’ve received an inch of rain? I use a highly sophisticated rain gauge–an old yogurt container placed on the ground among the plants. A tunafish or catfood can works equally well. I total the weekly rainfall and decide whether to water my new trees or my clients’ new plantings this week. This past week we received just over 1 inch of rain. — are your shrubs overgrown and in need of size reduction? it’s time to work on winter pruning of woody plants. Now, while plants are dormant, is the best time to do this: it’s easy to see the structure of the plant while the leaves are down, and the plant is most likely to react favorably while it’s resting. Contact me for coaching if you would like to learn to do this yourself, or for an estimate if you would like me to do it for you. — if you haven’t already done so, clean up the vegetable garden carefully: remove the spent plants; compost healthy ones, but throw out infested or diseased plants to prevent the spread of disease. But don’t clean up the perennial garden. It supplies food and cover for birds, butterflies, and other wildlife all winter. Little bluestem is a natural bird feeder that supplies seed all winter long. — plan for next season: Do it now, because later this winter everything might be covered in snow. Notice things that did great and things that didn’t, make lists of areas you want to improve, areas of lawn you could get rid of, places that are getting sunnier or shadier and need new plantings to suit. Did you have enough fall color in your garden? If not, plant some colorful native shrubs in the spring. Is there plentiful food for birds now? Plan to plant native perennials and shrubs on spring. And place your orders early, because native plant nurseries run out of the most popular species. Enjoy the garden this week and always, and look forward to spring! Few plant rival the beauty of our native flowering dogwood, Cornus florida, in bloom. 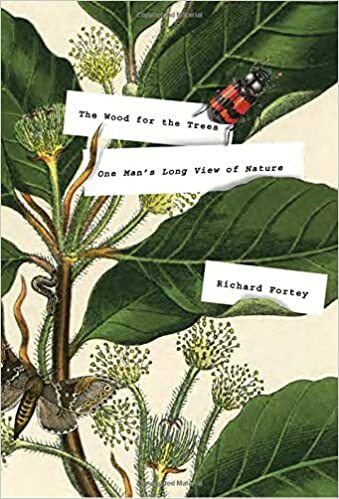 Biologist Richard Fortey has written a detailed description of a small British woodland–only four acres, but a world in itself–that manages to be both lyrical and scientific. This is the best kind of nature writing: it makes you both see and understand. Fortey doesn’t always write on this minimal scale. His modestly named book Life is the best overview of evolution you’ll ever read. This new book is highly recommended. American beech trees, especially young ones, retain their leaves in winter. Ever wonder why? An how will climate change affect our forests? — If you live in Bergen County, take the Parks Survey. It only takes a few minutes, and it allows you to say what you would like to happen to our precious remaining open space. While you’re on the CUES page, take a look at the list of public meetings and attend one if possible. — Check out the People’s Climate Movement, which is gearing up for massive demonstrations in the spring. In the meantime, attend a 100 Hours of Resistance Vigil or meeting this weekend. Check out events near you, and find out more about the climate movement, here. — Support a national environmental group: you know who they are. Pay your dues, make additional donations, sign petitions, make phone calls. Let the people who represent you know that you care about the environment. — Take a long walk or hike. It will make you feel better if you’re stressed, reconnect you with nature, and remind you that this beautiful world needs your help and support. Find a hike near you on the website of the New York-New Jersey Trail Conference or at NJHiking.com. Have a wonderful, peaceful, and environmentally friendly weekend. If the winter remains warm, we may see tiny hazelnut blooms early, perhaps a month from now. Look ahead to spring, when ferns, columbine, and tiarella can grace your shade garden. Yesterday I told you about Prairie Nursery‘s offer of free shipping on spring orders, available now through January 24 (plants will arrive on the date you specify in spring). Today the catalog for the annual plant sale of the Native Plant Center at Westchester Community College arrived. This is an opportunity to obtain a number of hard-to-find plants, such as spring beauty, golden groundsel, and alternate-leaved dogwood. Place your order by Feb. 21 and pick up your plants in April. Both of these excellent suppliers offer only pure species, which can be better at attracting pollinators than hybrids or cultivars. On Jan. 25 at 7:30, the Bergen-Passaic chapter of the Native Plant Society of NJ meets for the first time in our new location, the headquarters of the NY-NJ Trail Conference, 600 Ramapo Valley Road, Mahwah. The meeting will be extremely interesting to native plant enthusiasts: the speaker will be Carolyn Summers, author of Designing Gardens with Flora of the American East, and horticulturist at the Native Plant Center. Carolyn will have copies of her book for purchase and signing. At this meeting, we’ll also discuss plans for spring and summer field trips, including one to Carolyn’s garden in the Catskills, so be sure to attend. Contact bergenpassaic@npsnj.org with any questions. Aronia melanocarpa (black chokeberry) is one of the wonderful native shrubs you can find at both Prairie Nursery and the Native Plant Center plant sale. From now until January 24, Prairie Nursery is offering free shipping on all orders. Shipping charges can easily total 20-30 percent of your order, so this is a great deal. This excellent, long-established nursery is located in Wisconsin and sells Midwestern natives, pure species only. Because not all Midwestern natives are native to other regions of the country, gardeners who live in other regions should check the native status of each species they plan to order. Two good places to do this are the USDA Plant Database or the Lady Bird Johnson Wildflower Center. Many of the plants in my perennial borders (my “prairies”) originally came from Prairie Nursery. Twenty years ago, when I began planting natives, it was one of very few sources. It’s obvious to anyone who spends any time working with plants that they respond to their environments in many different ways. But they do much more than that: they communicate with one another, and they most likely feel emotion in some way. 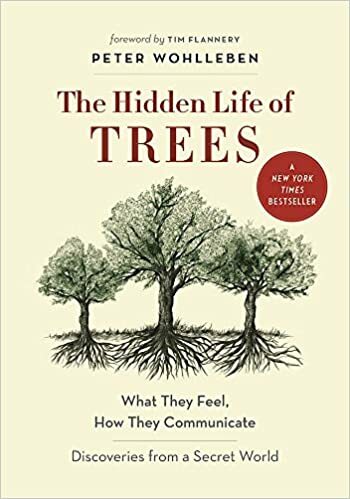 This book, written by a forester, reveals fascinating information about the hidden world of forests.